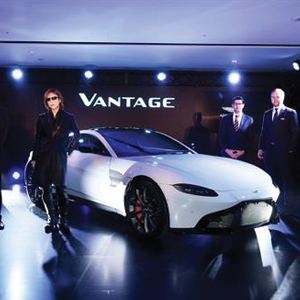 The brand centre launch was followed by the unveiling of the new Vantage, with simultaneous Vantage events in the UK, China and the United States of America. Following a welcome address by Regional President of Aston Martin in Asia Pacific, Mr Patrik Nilsson, Yoshiki surprised guests with his arrival at the event with two models wearing his latest hand-crafted kimonos from the Yoshikimono brand. The House of Aston Martin Aoyama is located on the renowned Aoyama Dori, and covers three floors with vehicle displays, a shop and entertaining space. Retail operations will commence from 1st December 2017, with a wide range of Aston Martin merchandise, gifts, models, accessories, clothing and luxury items. The House of Aston Martin Aoyama will offer visitors the opportunity to learn about Aston Martin’s heritage, lifestyle experiences and design philosophies, with the latest range of products available in the adjacent dealership facility. The House of Aston Martin Aoyama is located at 1-2-3 Kita Aoyama, Tokyo 107-0061, Tel +81 3 6459 2311. In addition to the newly opened brand centre, Aston Martin also has a growing dealer network in Japan, covering five major cities: Tokyo, Osaka, Nagoya, Fukuoka and Hiroshima.